As Hurricane Irma carved its vicious path of destruction across the Leeward Islands and then continued her course to ravage the Virgin Islands before heading for Cuba and the Florida Keys, the communities of the Caribbean islands, still reeling from the impact, stood strong and defiant as the wheels of various relief efforts started to turn. As reports start to come in about the devastation that has been caused by the passage of Hurricane Irma, the second most powerful Atlantic hurricane on record, we see the tragic impact of its landfall on the island of Barbuda in the Leeward Islands, leveling most of the buildings on this low lying island. 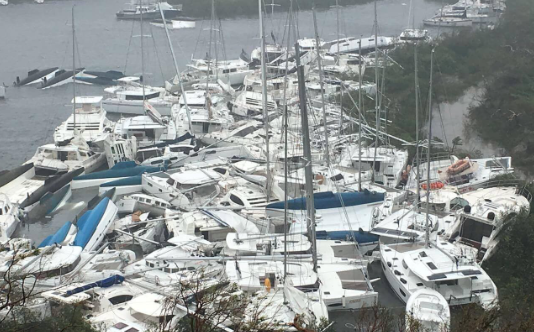 St. Barts and St. Martin were next in Irma's path, causing major damage and claiming nine lives. Yesterday afternoon, Irma came ashore in the British Virgin Islands at about 2pm, delivering the full force of a Cat 5 hurricane with a 12’ storm surge.